Sgt. 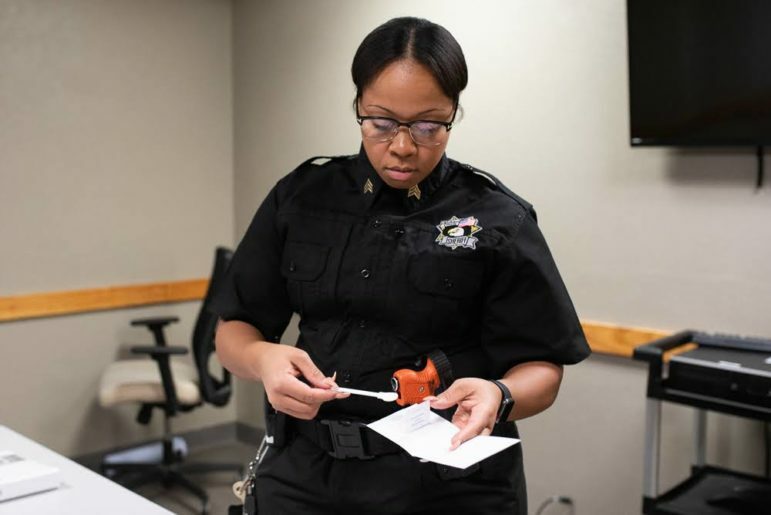 Ziakiya Byers, an Oklahoma County Sheriff’s deputy, shows a kit that is used to obtain DNA from individuals arrested on felony charges. The process requires a cheek swab and a fingerprint to confirm identity. The department has begun collecting samples from felony arrestees under a 2016 law that was delayed because of lack of funds. So far, hundreds of jail inmates have had the insides of their cheeks swabbed, and the samples have been forwarded to the Oklahoma State Bureau of Investigation, which soon will analyze and upload the genetic profiles to a national FBI database. The goal is to connect arrestees to unsolved crimes, which could lead to additional charges. Oklahoma County confirmed that it is swabbing arrested inmates, and an OSBI spokeswoman said 12 agencies have been trained so far on collecting DNA from arrestees. A list of those agencies wasn’t immediately available. A Tulsa County Sheriff’s Office spokesman said the county jail has not yet started the process. The collection of DNA from people arrested, but not yet convicted, on felony charges has spurred opposition from civil rights groups. The Legislature approved the program in 2016, but it has been stalled by lack of funding. Thanks to a federal grant, DNA swabbing is moving forward. The $740,000 grant, provided to the OSBI by the National Institute of Justice, paid for upgraded equipment, personnel, training of local law enforcement and swab kits. The bureau will need $500,000 annually from the state to continue processing the samples after the grant runs out at the end of 2019, OSBI Criminalistics Division Director Andrea Fielding said. About 600 samples have already been collected. They will be uploaded to the FBI’s system for matching DNA, called the Combined DNA Index System (CODIS), and entered into the National DNA Index System (NDIS). Excitement and outrage over the law appear to have faded, but the beginning of DNA collection could reignite debate. “Wait. What?” said Allie Shinn, deputy director of the American Civil Liberties Union of Oklahoma, when told that jails were collecting DNA from arrestees. The ACLU has called the swabbing of arrestees before conviction a violation of privacy rights and due process, an argument it also made when the Legislature approved the law. Sgt. 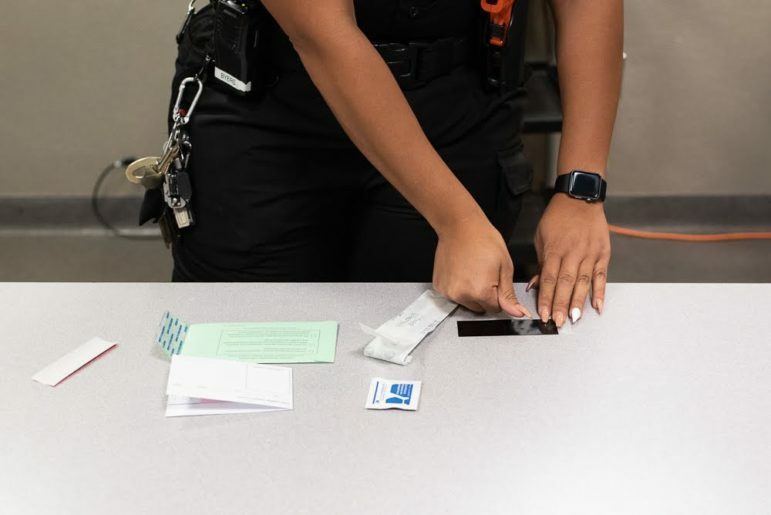 Ziakiya Byers of the Oklahoma County Sheriff’s Office demonstrates the process of collecting DNA from those arrested on felony charges, and those convicted of felonies, using a kit provided by the OSBI. Fielding said she is confident that after results start rolling in next year, state funding will follow. Oklahoma joins 30 other states in collecting DNA from felony arrestees, according to DNA Saves, a nonprofit that advocates for such laws. The state currently enters about 8,000 DNA samples into CODIS annually, taken mostly from convicted felons. Under the expanded law, OSBI estimates that number will jump to 20,000. The Oklahoma County Sheriff’s Office is one of the first agencies to begin taking DNA samples under the law. The county jail’s medical staff has been conducting the cheek swabs on individuals convicted of felonies and some misdemeanors for years, but expanding swabs to felony arrestees means more work for employees who are already spread thin, spokesman Mark Opgrande said. At the jail, DNA is typically taken after arrestees are placed in a cell instead of during the intake process, which includes a mugshot and fingerprints. To help out the busy medical staff, Sgt. Ziakiya Byers, a deputy, is adding cheek swabs to her daily duties. If convicted, arrestees who are swabbed will be charged a $150 “laboratory analysis fee” for each offense, according to the law. That will add another fee to the long list of fines and fees that criminal justice reform advocates argue already burden offenders, who often exit prisons or jails with debt they can’t pay. Arrestees who are not convicted later can have their DNA expunged from the national database, Fielding said, but the burden is on that person. They must contact the OSBI and provide proof that they weren’t convicted of the felony charges. Shinn, of the ACLU, said the burden should be on the state to remove the DNA of individuals who are not convicted. Most people won’t initiate the process themselves, she said. Shinn called the collection “an illegal search” and said the ACLU is “looking at all options” to halt the practice. “This flies in face of the notions of how our criminal justice system is supposed to work,” Shinn said. As she smoked a cigarette outside of the Oklahoma County jail on Thursday, Edmond resident Shea Sumner said she approves of the expanded DNA collection. Sumner’s ex-fiancé, who has been convicted of a felony, was arrested again Sunday. Her visit to the courthouse was related to his arrest.